Happy Monday everyone! If you haven’t noticed by now, the KLP logo, website + blog has a fresh, clean new makeover! It’s been a few years since I have updated everything and I thought it was about time for a pick me up. I wanted to update my brand to be consistent the photography work that I’m doing NOW and also reflect my personality + style. So with the help + genius of Jason Huang (logo + design) and Michael Acevedo (web design + wordpress development), I came with up a design that was just like me – cute, modern and functional =). EVERYTHING has been updated so feel free to look around and stay awhile – all the pretty new buttons lead to something fun =). And don’t forget – comments and messages are always appreciated and loved <3. And as usual, the blog will be updated regularly so keep coming back for me! There’s lots in store for KLP this year and I can’t wait to share it all with you! 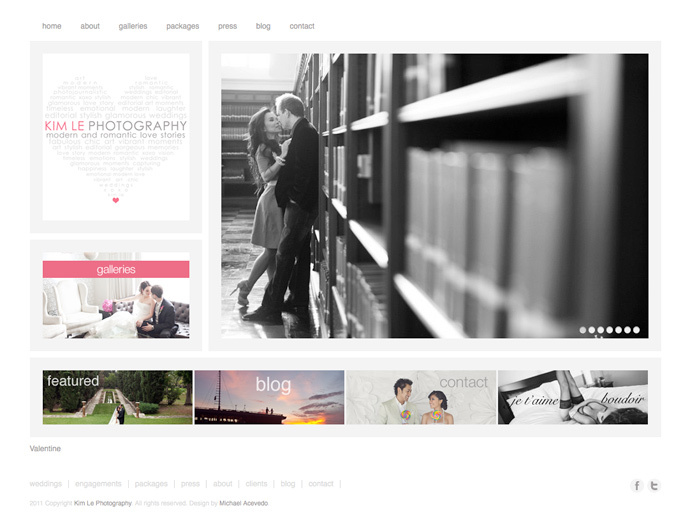 Tags: CSS Design Award, kim le photography website, Michael Acevedo. Just perfect. Love the new look and logo.